Lebanon produces around 7 million bottles per year. 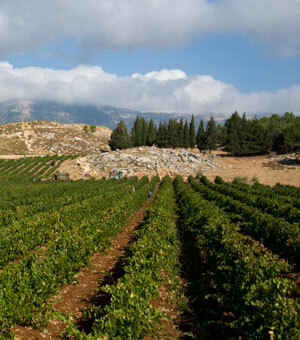 The majority of this comes from the Western Bekaa Valley and the hills above Zahle, but some producers are experimenting with new terroir – notably in Batroun and Jezzine, as well as areas in the Eastern Bekaa. The Bekaa Valley enjoys long dry summers, cool nights and consistent rainfall and is at an altitude of around 1,000m/3,820ft. The Bekaa has its own natural water table, courtesy of the melting snow running off the slopes of the Lebanon and Anti-Lebanon mountain ranges –so that some grapes rarely ripen before mid, and even late, September. In order to ensure quality yields are relatively low – averaging 5 tons per ha. At least a dozen new culitvars were introduced to the country during the 1990s. Today there are 2,00ha cultivated for the production of wine.